David E. “Jason” Rutledge was born in 1950 to a Sharecroppers daughter, is of Cherokee descent and native Virginian. He was raised in a farming family by grandparents that made their living from the land. He has been a lifetime farmer, father of four and is a co-founder of the Healing Harvest Forest Foundation. He is often called the visionary of this group that promotes “restorative forestry” and as a small group has influenced the entire forest products industry in unique ways. He is credited with coining many phrases of the current sustainable forestry movement, including “worst first” single tree selection, “pro-passive” erosion control, restorative forestry, Biological Woodsman, sliding scale payment system, to mention a few. 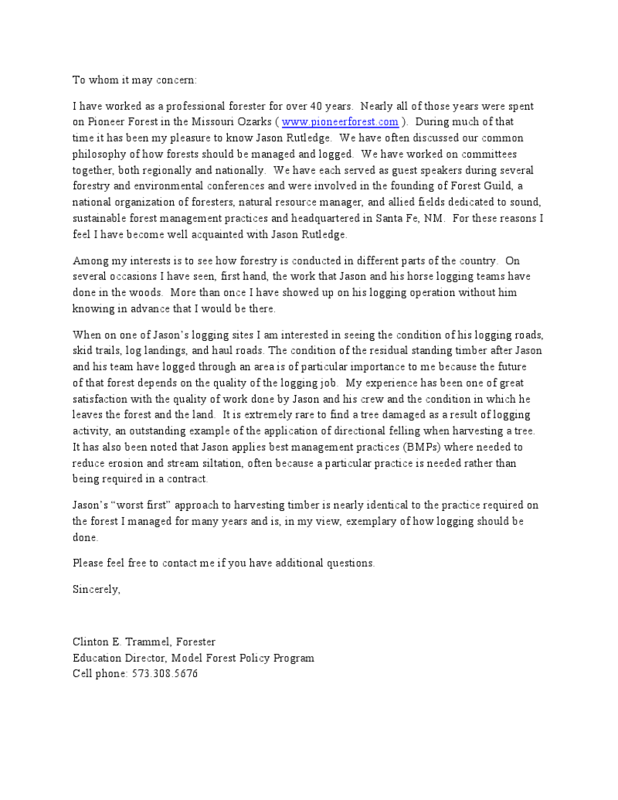 Jason is and has been a charter member of many sustainable forest interest groups over his 30 year career as a forester, with an emphasis on community-based restorative and therefore sustainable forestry and bottom up change in society. Jason has earned a tremendous amount of publicity over years of being a practicing “horse logger”. He has written many published articles and been featured in the printed media, on the cover of the Mother Earth News (July/August 87), Draft Horse Journal (Autumn 2004) and featured in many magazines, periodicals and newspapers. 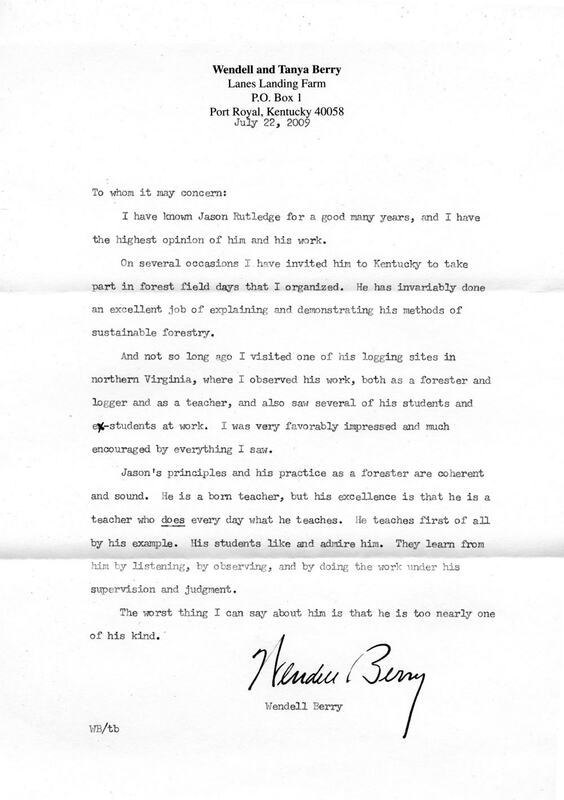 He has participated in many educational workshops and demonstrations with such notable figures in the field of rural issues such as Troy Firth, Carl Russell and Kentucky writer Wendell Berry. Jason has enjoyed other media exposure through television including, local commercial channels, PBS and cable on A & E (Documentary “In the Company of Horses”), RFD-TV (Rural Heritage TV) and History Channel’s Ax Men. 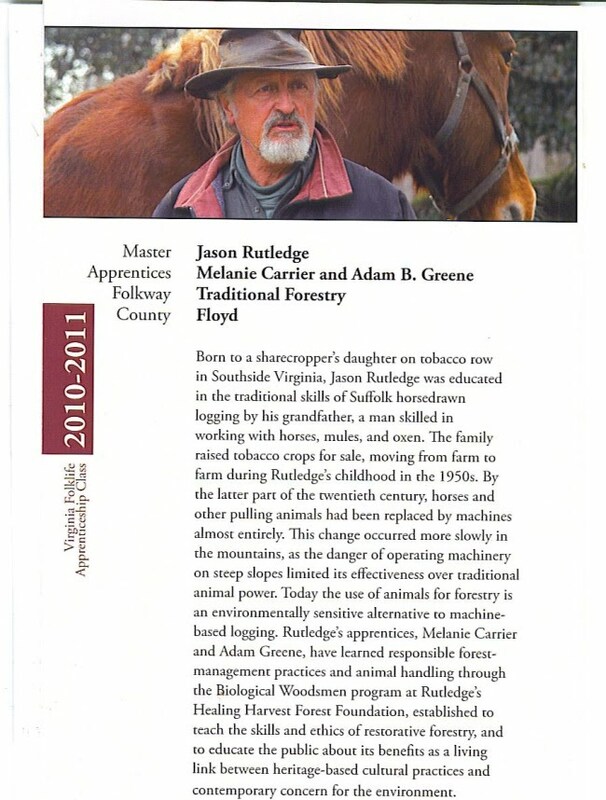 He has produced several instructional videos on his own including the titles like – An Introduction to Modern Horse Logging – Appalachian Style, Making a living, Horse Logging?, The Chronicles of the Biological Woodsmen and Community Based Restorative Forestry. Jason has trained over 200 people in the skills necessary to practice modern horse logging and restorative forestry, while inspiring the environmental ethic of why “man should age” the forest in a gentle way. Jason has been keeping, raising, training and breeding Suffolk Punch draft horses since 1981. Jason has also enjoyed the sponsorship of Pennfield Feeds, Southern States Co-op, Micron Bio-Systems, Draftwood Forest Products and others.